Some of you may have already been exposed to this debate, Ubuntu vs Windows, which do you choose. There are several factors when choosing your Operating System; Price, Familiarity, Windows only based applications, device support, to name a few, so let’s compare. Ubuntu is and will always be Free, so too is 95% of applications for Ubuntu. For normal users (Requiring Document Handling, Email and Internet) will find everything they need and more in Ubuntu. A typical Windows Installation including Office could set you back close on R2400,00 (Windows 8 and Office Home/Student). So on the price front, Ubuntu Wins. Both platforms are visually driven, and usage is very similar across both. 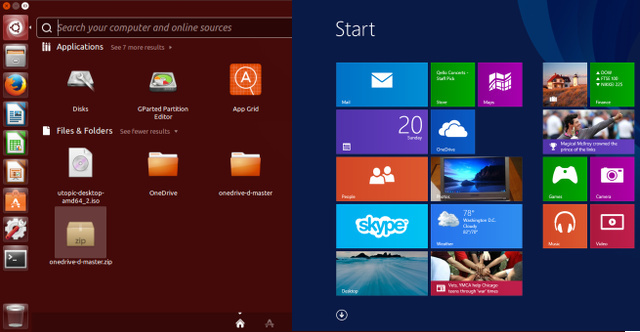 Both Windows 8 and Ubuntu look pretty great, so it’s hard to say whether one is “prettier” than the other. As far as design goes, I believe that Ubuntu’s makes more sense. In Windows, the start screen separates you completely from the desktop, and Metro apps do not integrate very well with regular desktop apps at all. All Ubuntu apps integrate well with each other, however, and the Dash doesn’t take you away from the desktop. Minor variations like the Close, Minimize and Window icons on Ubuntu have moved to the left top of the Window, while Windows remains in the Top Right. Windows users will struggle at 1st to come to grips with the slight variations, but once they have a handle on it, it will be all systems go. So on the familiarity front, it would be a tie. In this case, Windows obviously pulls ahead, the main reason being Windows market penetration and it being around so long, forced software creators to concentrate primarily on Windows based software. That said, Ubuntu is fast catching up, its Libre Office Suite has applications that mirror Microsoft’s Office Suite in functionality (And is also Cross Platform so it can open Microsoft Data Files), plus a few extra’s like LibreCad, Free Templates and Extensions. For those must have Windows applications, Ubuntu offers WineHq which allows you to run (some) Windows applications on Ubuntu. Wine is a work in progress, so it won’t run every application perfectly — in fact, some applications may not run at all — but it’s improving all the time. So on the Application front, its a Tie. Is my device supported? In general the answer is yes. Ubuntu supports a very large percentage of devices on the market and has backwards support for older devices. In limited cases were Ubuntu doesn’t have a drive, be assured they are working on fix. On the Driver front, Windows is slightly ahead. So which is the right choice ? If you kept score on the points above you’ll see its almost a dead heat, however, in most cases price normally wins, so Free vs Paid puts Ubuntu as a winner, but its really down to personal choice. Sure there’s a learning curve when switching from Windows to Ubuntu, but then so too has there been a learning curve between Microsoft’s Major Updates.